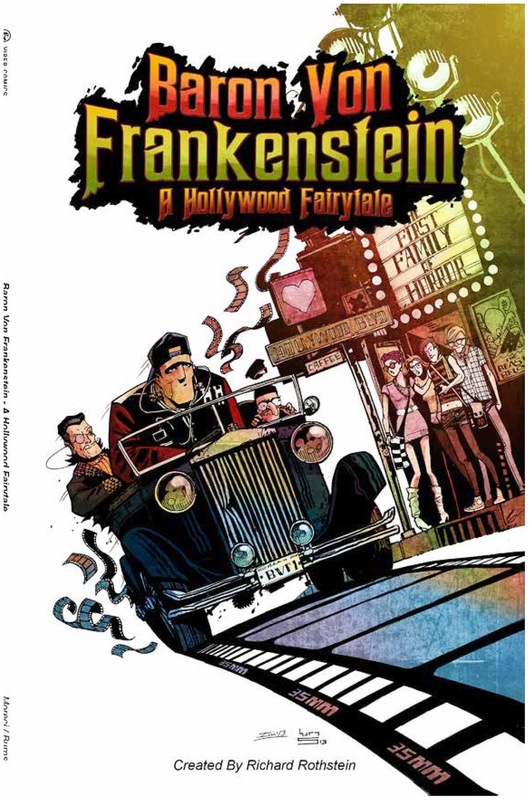 The Fellowship was fortunate enough to obtain a copy of BARON VON FRANKENSTEIN: A HOLLYWOOD FAIRY TALE from Viper Comics. The story was adapted by Michael Moreci based on an original screenplay by Richard Rothstein. The art is by Keith Burns. Life is slowing down for a group of aging movie monsters (the monsters played themselves in all those movies, of course). They’re not getting as many acting jobs as they once did, and they’re pretty bored with their day jobs. The Baron is the de facto leader of the bunch (as chair of their union), so when he disappears into thin air, his sidekicks Monster and Igor go to great lengths to find him. Even though the other monsters aren’t quite as worried about it. What non-fans don’t always realize about the horror genre is that horror is really only part of the story. And the way this story works is to use some bending of different genres in order to move the story along. So Monster and Igor are comic characters who use detective skills to produce a thriller ending to a somewhat dramatic story. It takes some serious work to pull something that complex off, and this book definitely pulls it off. The art is also top-notch; there are just as many twists and turns visually as there are storywise, and it all flows seamlessly here. It sounds a bit cliché, but this book really does seem to have it all, right down to defacing the Hollywood sign. I highly recommend it. 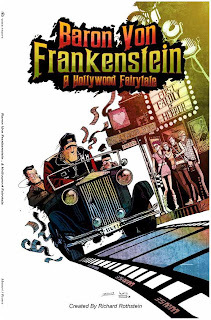 BARON VON FRANKENSTEIN will be available April 26 on Apple iBooks, Amazon Kindle, Nook, and Kobo or check it out at vipercomics.com.